Fires started by lightning often erupt in very remote, mountainous parts of the state, far from any roads. Sometimes the only way to get fire crews to them is to have them jump out of planes. It takes a special breed to jump (a) out of a perfectly good airplane, and (b) into an active fire zone. But smokejumpers have been doing it for decades. From 1,500 feet above the Sierra Nevada, the trees are bushy green dots and everything on the ground blends together. Standing out in this sea of green is a stream of dark smoke snaking up from the forest. Lightning hit here moments ago and sparked a fire. The plane circles (and circles) until the crew spots a safe place for them to land. Then one-by-one, the smokejumpers leap from the plane. They're wearing fire suits underneath yellow jumpsuits, along with knee pads and heavy duty ankle braces. They're carrying emergency gear, like a 150-foot rappelling line, in case their parachutes get caught in the trees. The chainsaws, axes, food and drinking water all come on a cargo drop later. "We never jump into the middle of a fire. It’s always right next to it," says Josh Mathieson, operations captain at the base in California. The state has one unit, based in Redding, out of nine nationwide. Mathieson has made 350 jumps. Tall and bald with a bit of grizzle on his face, he sort of resembles a slender version of action-movie star Jason Statham. "I mean, I could jump right next to a fire," he says. "I do it a lot. Or sometimes it is a little further away based upon terrain, trees. There’s no spot to jump into sometimes, so it depends." So they jump out of planes toward a fire, toward trees that are on fire with all that unpredictable wind. "You know, I was so scared of heights when I got here," says Franki Betancourt. He’s been a smokejumper since 2012. He's a slender, former Marine with dark hair and a perfectly trimmed handlebar mustache. "My first jump was on the Sierra National Forest. You have all these practice jumps -- 16 practice jumps -- and they’re all nice little meadows. Nice little open flat green spots. And first fire jump, there’s no open meadow or flat green spot. In fact it was just a side of a slope." "It’s so surreal at the time," he recalls. "The rush. It’s your first fire jump, you have that rush, you don’t really have time to think." To be a smokejumper you have to be a firefighter first, then you train in how to jump. Think of it as extreme skydiving. But unlike skydiving, when you might celebrate a successful landing, Mathieson says a smokejumper's job just begins with the landing. "You take that jumpsuit off," he says. "The parachute sits in a bag and it’s time to dig line, run a chainsaw, coordinate aircraft or whatever. That's when the real work starts." Because there's no access to water the crew builds a containment line to stop the fire, chopping, digging and removing anything close to the blaze that might burn. That's often when the real danger begins. Last summer, Mathieson lost a member of his unit. Luke Sheehy, a 28-year-old smokejumper from Susanville, was killed when he was caught under a falling limb while fighting the Saddle Back Fire in the Modoc National Forest. Mathieson says he’s been out battling a fire for as long as 2 1/2 weeks. Planes just keep dropping more supplies to the crew. Then after all that, they hike out, often for miles. Mathieson's been doing this work for more than a decade. Starting pay is around $31,000. 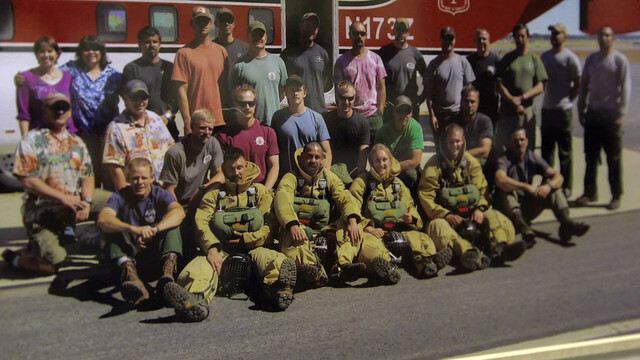 When Disney was developing its movie, Planes: Fire and Rescue, released this summer, members of that team came here to Redding, to watch the smokejumpers in action. They consulted with Mathieson and other members of his crew. "They did a great job of capturing the lingo," says Mathieson. "Stuff only we'll pick up on." A number of other movies and TV shows have showcased smokejumping, maybe because it's dramatic and unusual, a job about heroes taking it to the extreme. But for Betancourt, it's more simple and meaningful than that. "I just tell myself this is who I am. This is what I am," he says. "So this is like, the best job in the world. I'm a smokejumper." And it's a good thing they like doing what they do. If the weather experts are right, August could be a record-breaking month for wildfires started by lightning strikes in California, keeping Betancourt, Mathieson and their fellow smokejumpers very busy.